The incredible suit looks a lot like outfit worn by Tony Stark in the hit movies - but it's a real-life invention. This might look like something out of a Marvel movie, but the massive exoskeleton is actually real. The prototype 'mecha-exosuit' is a nod to the Robert Downey Jr Iron Man blockbusters as it's been put together by a team who are thrilled by comic books and cartoons. The NK-01 has been showcased in Beijing by its proud owners, Chinese tech-company FutureWise. And much like Iron Man, the incredible invention can even be piloted by a person wearing the suit. The grey, silver and black colour scheme even echoes Iron Man's fellow suit wearer War Machine, who features in the forthcoming Marvel film Civil War. Han Lei, FutureWise's CEO explained: "When we were young my team and I loved watching robot cartoons." "Many Chinese people… were influenced by Western and Japanese animations such as Transformers," he continued. "So, we teamed up to work on this project." The 32-year-old is leading a team of 17 in Beijing's Zhongguancun tech area, as qouted of Mirror.co.uk. 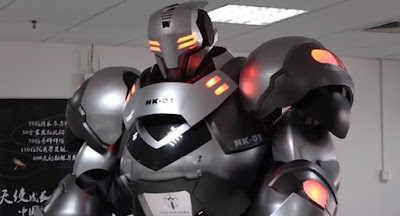 And while the suit itself is currently just a prototype, the company intends to become the first company to commercially produce these impressive futuristic outfits.